The Swarm System is the latest development from the American defense industry. The concept is plain: to confuse the enemy's air defense systems by creating interference. 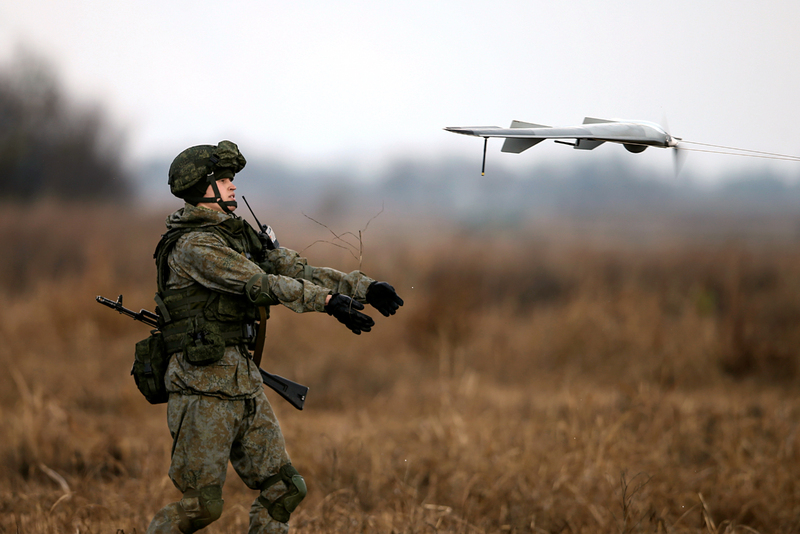 Photo: A Russian soldier launches a drone. Russia is developing new technology to neutralize drone-based combat systems like the U.S.-designed Swarm. The new weapon will use electromagnetism to disable unmanned enemy craft. At the end of October 2016, a representative of Russia’s United Instrument Manufacturing Corporation stated that the company's specialists had finished working on an entirely new type of weapon. Its main feature is the target that it will fire at: combat mini-drones. Drones, which armies began using as weapons about 10 years ago, have completely changed the situation on the battlefield, where the soldier is gradually being squeezed out as the main combat unit. Reconnaissance and attack, things that earlier were impossible to do without direct human involvement, can now be done by robots. Drones look like mini-models of planes from the outside. But in reality effective weapons can be mounted on them – and not necessarily guns or missiles. The drone is almost an ideal platform for positioning electronic warfare devices. What is Swarm and why is it dangerous? The Swarm System is the latest development from the American defense industry. Its idea is as simple as the system is complex when used. The concept itself is plain: to confuse the enemy's air defense systems by creating interference. This concept has already been used on several occasions and not unsuccessfully. However, Swarm's particularity is that drones are employed to block the functions of radar stations. The system does not consist of one or two machines. Its name speaks for itself. The carrier, which can be any flying apparatus, launches several dozens of drones, which act like a swarm of bees. Each drone is an autonomous combat unit. It can be equipped with any type of weapon, from a missile to an electronic device. Nevertheless, Swarm acts as an organic whole. Each of the drones making up the system has a certain function, such as conducting reconnaissance, creating interference or launching a missile strike. The drones simultaneously transfer information to a single control point and exchange it with each other. This basically results in a new type of combat system capable not only of covering an air invasion into an air defense area by suppressing enemy radars but also of striking targets in the given location. Traditional air defense systems are helpless against Swarm – it is practically impossible to suppress it with missiles. How will the new Russian weapon fight Swarm? If Swarm is able to reach its target, it is almost impossible to stop it. That is why the new development created by Russian engineers is designed to block it as it is approaching. Unlike the systems from the previous generation, the new weapon is oriented towards an active way of functioning. Instead of simply creating radio interference, the new weapon incapacitates all drones’ on-board electronics. The drones are not destroyed physically; they are just turned into plain pieces of metal. Instead of ineffective fire targeting a miniature flying apparatus, a completely different tactic is used. It disrupts communication between the drones in the swarm and their central control. For now the development is confidential and how exactly the Russian weapon acts technically against the flock of drones is not being divulged. Specialists assume that the system works by inflicting electromagnetic damage upon its target. This seems to be the case. Russia has long relied on the combat use of electromagnetic radiation. If so, the drones are struck by a high-voltage current, which literally burns their "insides." An electromagnetic bomb is also effective against them. Exploding at a height of several hundred meters, the bomb incapacitates all electronics found within a four-kilometer radius. Many questions, however, still remain unanswered. For example, it is not known how exactly the striking electromagnetic impulse will be generated and directed. Yet it is clear that Russian weapons are entering a new level of development.